Temperature: 235-255F (115-125C) Certification: CE Transfer Products: (Dark Fabric T-shirts, Caps, Mouse Pads). 1. Print Mirror Image on the paper. 2. Use Ink Jet Printer with original inks only. 3. Use the paper setting as "Normal". 4. For best results use "Photo Quality" Option. Pre-prees the material for 5 seconds Wait until the print is perfectly dry & if necessary weed the non-printed films. After imaging, the film is stripped from it's backing & placed directly on the dark fabrics, Next place the included release paper on top & press with maximum pressure. Wash inside out in cold water. DO NOT use bleach. Place into the dryer immediately and do not hang to dry. DO NOT iron the shirt's image surface again. Best performance is obtained on cotton, polyester, poly/cotton 50:50 blends. 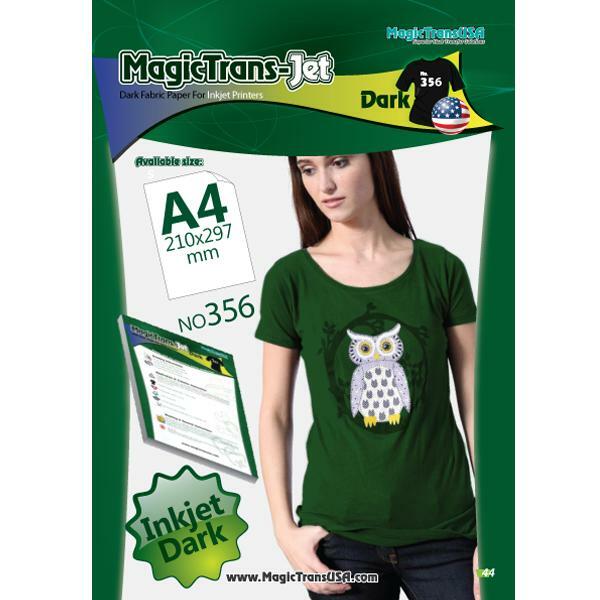 We highly suggest you to test your inks (wash test) prior to producing multiple transfers to ensure that the ink does not run. Please keep your papers in the plastic bag until actual use. This will keep moisture out of the paper. Close the bag after each use.